The biggest boat show in Europe – Cannes Yachting Festival – Art, Food, Travel and Fashion! The Cannes Yachting Festival is one of the trade shows organized by Reed Expositions France which, like FIAC and Paris Photo, enables international and demanding customers to discover the best of the world’s offer in an exceptional setting. For six days, the stars of French and international yachting, presented by the crown jewel of the nautical industry, rival each other in their luxury, style and elegance, echoing the glamour of their superlative host city! 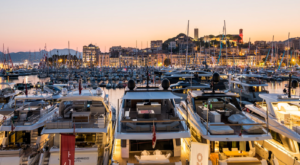 While the in-water spaces are occupied by the jewels of the seas, the quays of the Vieux Port and Port Canto bring together the biggest names in terms of equipment and services, as well as the show’s prestigious partners. Last but not least, the Cannes Yachting Festival is organizing the 4th Concours d’Elégance. A parade of vintage and contemporary boats, reserved for owners or collectors of motor boats and day boats of less than 12 meters. It can be admired at the Vieux Port from the Festival beach on Saturday 15 September at 4 pm.